The first two volumes in the monograph series are about Khirbet et-Tannur, a hilltop sanctuary located near Khirbet edh-Dharih on the King’s Highway, the third caravan stop 70 km north of the Nabataean capital Petra. In use from the 2nd century B.C. to the 4/6th century A.D., this temple complex is exceptional because of the information it provides about religious practice due to the astonishing preservation of carbonized cult offerings and vessels. Specialist examination of these reveals continuity of Iron Age religious customs after the Roman conquest of Arabia (in A.D. 106) in a sanctuary of local design, but with architectural decoration and gods in classical form in a fascinating iconographic programme. Summary of the volumes are below. Both volumes can be purchased from Amazon. To learn more about the ongoing work on Khirbet et-Tannur by members of the Manar al-Athar Team, click here. Annual of the American Schools of Oriental Research 67 (2013) (Manar al-Athar Monograph 1). J. S. McKenzie, J. A. Greene, A. T. Reyes, C. S. Alexander, D. G. Barrett, B. Gilmour, J. F. Healey, M. O’Hea, N. Schibille, S. G. Schmid, W. Wetterstrom, and S. Whitcher Kansa; with contributions by K. da Costa, P. Degryse, K. Eremin, S. Gibson, O. Gingerich, and E. Khamis. (368 pages, 455 illustrations. ISBN 978-0-89757-035-0). An introductory chapter presents the intellectual and historical contexts in which Glueck was working and his methodology (in the pre-war years, during the Arab uprising). This is followed by detailed presentation of the basis for the reconstructions and phases of the sanctuary, its iconographic programme, what the results tell us about Nabataean religious practice, and the date of iconoclastic destruction. The spatial settings of the finds and cultic activities are provided by new reconstructions of the temple complex, improving on inconsistencies in those published by Glueck in Deities and Dolphins(1965). The studies of the lamps, pottery, and glass provide more precise chronological information that has made it possible to date newly identified sub-phases, and so to track the growth and decline of worship at the temple. More evidence was detected for continuity from the Edomites (the Nabataeans’ Iron Age predecessors). In addition, 4th-century use of the site by worshippers, rather than by ‘squatters’ (as previously assumed), was identified, clarifying the process leading to the cessation of worship and the A.D. 363 earthquake, when evidence was trapped. 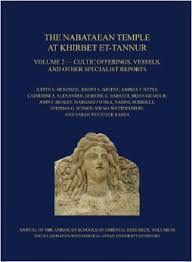 The results are placed in a broader context of Nabataean religious practice and iconography. The design of the temple complex, which is unlike other Nabataean sanctuaries, was found to be most closely related to an Edomite forerunner, Horvat Qitmit, where similar types of offerings also survived. 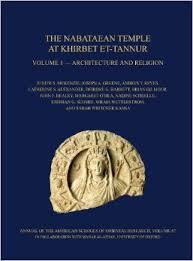 That the main god and goddess at Khirbet et-Tannur were worshipped through cult statues in figured form refutes the commonly held assumption that the Nabataeans, like their Jewish neighbours, had a prohibition against the representation of figures. Furthermore, the Nabataeans’ nuanced understanding of figured sculpture is revealed by their sophisticated use of attributes of a variety of deities, and of personifications, including those of the Fish and Grain Goddesses now known to represent signs of the zodiac (rather than aspects of the goddess Atargatis), as discovered in the related temple at Khirbet edh-Dharih. Glueck assumed that the numerous busts decorating the Khirbet et-Tannur temple represented an eclectic mixture of eastern and western deities. However, this new study has determined the original location its extensive architectural sculptures, revealing that these formed a cohesive decorative programme, reflecting the sanctuary’s local religious role. It was focussed around a main god and goddess, and the heavenly bodies, which controlled seasonal rains and thus agricultural abundance. Aspects of the Egyptian god Serapis were detected in the cult statue of the god, rather than just Hadad and Zeus as previously identified. The goddess, whose attributes were found to include those of the Egyptian Isis, was apparently the supreme Nabataean goddess Allat (consort of the Nabataean god Dushara), rather than Syrian Atargatis. Reflecting her roles, the goddess was also represented as a unique version of Tyche (the goddess of Good Fortune) and as the goddess of the local spring in the famous Vegetation Goddess panel (featured in the new Jordan Museum in Amman). Annual of the American Schools of Oriental Research 68 (2013) (Manar al-Athar Monograph 2). (349 pages, 152 figures, ISBN 978-0-89757-036-7). Glueck’s excavation records are presented, including his annotated excavation diary, followed by the specialist reports on the non-architectural finds. As knowledge has progressed considerably since 1937, scientific analyses of the samples by an international multi-disciplinary team of experts have produced remarkable results. S. Whitcher Kansa demonstrates that the animal bones include burnt offerings, such as cattle presented on the main altar. W. Wetterstrom (Harvard) not only identifies species of carbonised grains in proportions indicative of their role as offerings, but also, surprisingly, discovered remains of burnt offering cakes. The corpus of pottery vessels studied by S. Schmid (Berlin) was selected for ritual use. They also indicate associated banqueting with much drinking, evident from glass beakers identified by M. O’Hea (Adelaide). Analysis of lamps by D. Barrett (Harvard) has suggested some common types were only used in domestic contexts, while others were specifically for night-time rituals, which are also suggested the famous zodiac and other iconography. Chemical analysis of the glassware by N. Schibille (Oxford) and P. Degryse (Leuven) reveals it was manufactured locally, largely with re-cycled glass unlike in the metropolis of Petra. Re-examination of the inscriptions by J. Healey (Manchester) indicates a local focus, along with worship of the Edomite god Qos. On the other hand, A. Reyes (Groton/Oxford) found that the incense altars suggest pilgrims also came from further afield. Microstructural analysis of the iron door hinge by Brian Gilmour (Oxford) shows it is an exceptionally early example of ultra-high carbon steel (like that later used for Damascene swords), reflecting the use of expensive resources, when necessary, at what was clearly an important regional sanctuary. To purchase volume one, please click here. To purchase volume two, please click here.